The bald comb over wig is perfect for creating an old age or balding character for Halloween or theatrical performances. 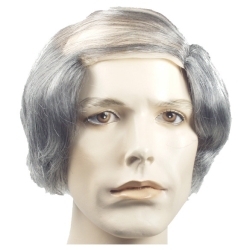 Pair this wig up with our old age make-up kit to create a picture perfect old age character. The bald comb over wig is available in black, brown, gray, or white. The wig features an elastic band for a comfortable and secure fit to almost any head size.